The Rockford IceHogs, AHL affiliate of the Chicago Blackhawks, had themselves a pretty light week in terms of the schedule. The Hogs had just one game this past week, a Wednesday night matchup with their closest and biggest rival, the Chicago Wolves. I considered taking the week off and just including a recap of the game in my next post. At that point, I realized that I had lots of thoughts on the IceHogs in general and some players in particular that I haven’t had much of a chance to discuss. Wednesday, December 21, 5:50 p.m.-Upon entering the BMO Harris Bank Center (picking up my promotional hat and trying to ignore the folks in line complaining to the security staff that they were there first), I notice that the microphones normally attached to the plexiglass are noticeably absent. Also, there aren’t two or three extra cameras set up around the arena. We are playing the Wolves, right? This must be one of those rare occasions where the Wolves are not televising the game from Rockford. I guess the logic is that with the holiday’s approaching, no one will miss a sleepy little mid-week game between two bitter rivals. What’s at stake, except for a wood and plastic trinket otherwise known as the Illinois Lottery Cup? Leading the IceHogs out of the tunnel tonight is Lars Johansson, just back from his stint backing up Scott Darling in Chicago. I thought Mac Carruth (1.90 GAA/.935 save percentage in his last three starts) was possibly going to get the chance to stay in net. Carruth has been up and down in spot duty this season. He has, however, looked solid with steady work. I guess Ted Dent wants to get his number one guy back into game action after a couple weeks off. Fair enough. Dent is also going with seven defensemen tonight, scratching Jeremy Langlois, Spencer Abbott, Nick Schmaltz (confirmed injured Tuesday) and Brandon Mashinter (likely injured, hasn’t dressed since December 7). I would assume that Abbott is also banged up. Jeez, lots of offense missing from the lineup tonight. A little shorthanded up front, but let’s see what happens when the puck drops. 7:40 p.m.-Nothing happens in the first period. Oh, sure, the teams skate up and down the rink, Rockford puts up ten shots on goal and kills off a P.C. Labrie boarding penalty. They also whiff on three turns on the power play. Neither team scores and things seem quite pedestrian through 20 minutes. Labrie, who smashed his way to a career-high 20 goals a season ago, is the only IceHogs forward on the current roster with a goose egg in that column. He’s had plenty of chances. Like this year’s team, however, converting those chances has been problematic. The fans have plenty to grumble about. None of the Hogs forwards are having big seasons offensively. 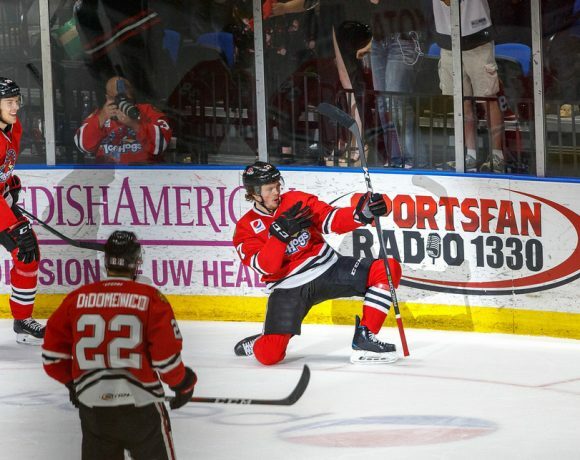 The team’s leading scorer, Tanner Kero (who was called up to the Hawks Thursday), is on pace for 19 goals. Why the under performance? Simple. Speed. Rockford can’t generate prime scoring opportunities via the rush into the offensive zone, as has been the case in previous seasons. They don’t pass well enough to create scoring space around the net. 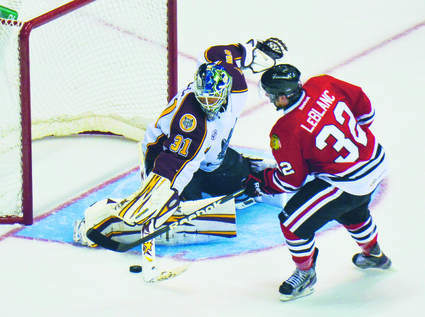 The IceHogs really have to work around the net and pounce on loose pucks. It is little surprise that they’ve been near the bottom of the AHL in scoring most of the season. With the Blackhawks top prospects pressed into service in Chicago, the IceHogs are comprised mostly of veteran acquisitions. Depth players who provide veteran leadership but not necessarily a lot of point production. That will almost certainly be rectified next season, when a host of prospects should be heading to Rockford from juniors and the college ranks. Right now, the IceHogs are as light on legitimate prospects as they have been since becoming a Hawks affiliate. Things don’t bode especially well for Rockford this evening with Schmaltz and Abbott, two of the Hogs more prolific offensive players, out. Kero, who normally skates with Schmaltz and Abbott, is skating on the wing with Jake Dowell and Kyle Baun. That isn’t to say I am disparaging Kero’s linemates on this night. Both players have been playing their roles well this season. They just aren’t top-six type players. Dowell is breaking a Hogs franchise record, playing in his 300th game with Rockford. Dubious honor, you say? Perhaps; though I, unlike many of you, have zero games played in the AHL. I view Dowell as a guy who has faced his share of adversity and carved out a decent pro career at age 31. Lots of AHL teams feature veteran presence that provide consistent leadership. Jeff Hogan, now with Iowa, served that role for several seasons in Grand Rapids. Current Wild captain Maxime Fortunus served in a similar capacity in Texas for six years. I could see Dowell sticking around for several seasons in his current role, perhaps moving on to a coaching position somewhere. I guess its up to him and the club, but it would be nice to not have the revolving door at captain normally seen in Rockford. Baun has had a solid sophomore campaign. He really has. If an injury-marred rookie season was unfortunate, this year has gone well for the former Colgate forward. With the dearth of prospects on the roster, this has really been a chance for Baun to show the organization what he can do. I’ve spent a lot of space here doubting Baun’s ability to crack an NHL roster. To be honest, I still question whether he has enough game to play at the next level. On the other hand, Baun has shown a real work ethic in the corners and laid some big hits on opposing players. He has earned a role on the special teams and contributed around the net. Baun has four goals and six helpers so far this season. Aside from Evan Mosey, who has played just nine games, Baun is the only Rockford player with a positive skater rating (plus-one). He’s making the best case he can to the Blackhawks in terms of keeping him around. I know the man is working hard. He’s worth a deuce. 8:14 p.m.-…since I’m holding a microscope to this game, I have to point out that around this point in the contest, Ville Pokka takes a puck to the face. The defenseman is bleeding from the mouth but still skates for another 45 seconds before getting the chance to get to the Hogs bench. The media timeout is a bit longer than usual, as the ice crew has to scrape up the blood trail left by Pokka. Yes, Pokka returns to action later in the period. 8:16 p.m.-At the 9:25 mark, Vince Dunn has a Wade Megan shot bounce off of his stick and into the air. Floating eephus-style over Johansson, who is crouched in the butterfly position and doesn’t see the shot, the puck drops across the goal line and Chicago takes a 1-0 lead. Tough break, says I. On a night where goals look to be hard to come by, this just might hold up. Exactly one minute later, Evan Mosey swoops across the crease, takes a pass from Tyler Barnes, and beats Wolves goalie Phoenix Copley to the twine. The game is knotted at a goal apiece. That line stays out on the ice to take the faceoff. Just 21 seconds later, Barnes finds Sam Carrick in front of the net. Tick…tick…tick…tick…BOOM! 2-1 Rockford. Hogs coach Ted Dent removes this juggernaut of a line from play and brings in fresh skaters for the resulting draw. Meanwhile, for some reason, Copley is hooked in favor of Jordan Binnington. Not sure why; there was little Copley could have done on either Hogs tally. Less than a minute later, Carl Dahlstrom fires away from the top of the right circle. A sweet screen by Baun keeps Binnington from tracking the shot. It winds up behind him for a 3-1 IceHogs advantage 11:45 into the second. That group stays out for the faceoff…and Kero scores on a spectacular sliding play at the net 29 seconds later. Rockford has exploded for four goals in the space of a minute and 49 seconds. Not to be outdone, Chicago cuts the lead to 4-2 13:16 into the period when Megan scores from the slot. For those keeping score, we’ve just seen six goals in 3:51 of ice time. Neither team dents the net in the final 6:44 of the period, but no one is complaining. 8:48 p.m.-The Chuck-A-Puck takes place; I only know this because it happens every game at this point. Most nights I am already in the concourse updating my twitter followers (@JonFromi) on the flurry of second period action. I do stick my head in to watch that night’s attempt at shooting the puck through a puck-sized opening from center ice. This evening’s shooter is going the unorthodox route, opting to fire his attempt backhanded. You know what? Good for him. I have had two opportunities to take a shot from the blue line after games at the BMO and failed to hit the net either time. Why the hell not try it his way? Still, the attempt does not reach the target and the fail streak continues to approach forever. 9:07 p.m.-Two insurance goals come in similar fashion early in the third period. Carrick gets his second of the night off a feed from Labrie at 4:54. The IceHogs get a 2-on-1 a moment later, with Dowell taking a pass from Mosey and lighting the LED at the 6:01 mark. At this point, the 3417 who came to the BMO for free plaid bomber hats have but one thing on their minds. That would be free Culver’s cheeseburgers. Six goals has assured everyone the option of one free concrete mixer. However, seven goals by the IceHogs ups the ante. And so the Cheeseburger Chant begins…right about the time that Connor Bleakley gets his stick in the grill of Mark McNeill, then gets tagged with an unsportsmanlike conduct penalty on top of the high-stick. Rockford has two full minutes of the two-man advantage. The Wolves dig an even deeper hole for themselves as one of the three defenders loses his stick seconds into the Hogs quest for cheeseburgers. Vince Dunn picks up an unsportsmanlike conduct penalty and Alex Friesen goes to the box for throwing his stick. So…now the Hogs have four uninterrupted minutes of 5-on-3 time in which to send the fans home with visions of butterburgers. Rockford, of course, fails to convert. Which is 100 percent fine by me. I can make a cheeseburger at home. The concrete mixer is the more expensive item on the Culver’s menu anyway. I don’t know why anyone would root for a less-valuable prize. I always hope and pray for six goals. Tonight, I shall receive six goals. 9:34 p.m.-An impending three-game win streak, free custard, and a hat. What else do I have a right to expect from this weeknight affair (that the Wolves, remember, elected not to broadcast)? Several times during what has turned into a rout of the Wolves, I have had it in the back of my mind that tempers could boil over. It’s kind of the norm between these two teams, to be honest. With just over a minute remaining in the game, things get a little punchy. Viktor Svedberg is sent to the box for hooking. Labrie vociferously objects. He is cited for P.C. Labrie-type behavior and is escorted towards the Rockford tunnel by the officials. As he passes Binnington, Labrie has some words to say to the Wolves goalie. Binnington, who has been developing a pair of rabbit ears as the night wears on, says some words in return. Despite the officials attempt to reign in Labrie, he gets within smooching distance of Binnington. Only they don’t smooch. Unless you count Binnington’s stick. The two players square off. The remaining skaters, who are on the other side of the rink awaiting the faceoff, come flying down the ice. Dowell and Dunn have a spirited bout. Binnington is pulled away from Labrie and escorted to the visitor’s exit. Meanwhile, Johansson has skated to the Rockford blue line and is removing his gloves. To the dismay of everyone in the building not wearing a striped shirt, the officials prevent a goalie fight and a likely line brawl from taking place, as Binnington already has one go-round in this melee. The Chicago net-minder plays to the crowd, doing everything short of pulling a Ned Braden before exiting. Copley returns to the net. When the smoke clears, Labrie, Dowell, Binnington and Dunn all get fighting majors as well as game misconducts. In all, 69 penalty minutes are dispensed at the 18:53 mark. The game soon draws to a close. The way this game ended, one would think that the rematch would be rife with fisticuffs. That takes place Wednesday night. The Wolves are not broadcasting this game, either. Rockford is in action Monday night in Iowa before returning to the BMO Wednesday to take on the Wolves. In addition to those games, the Hogs host the Wild Friday and go to Grand Rapids Saturday night. 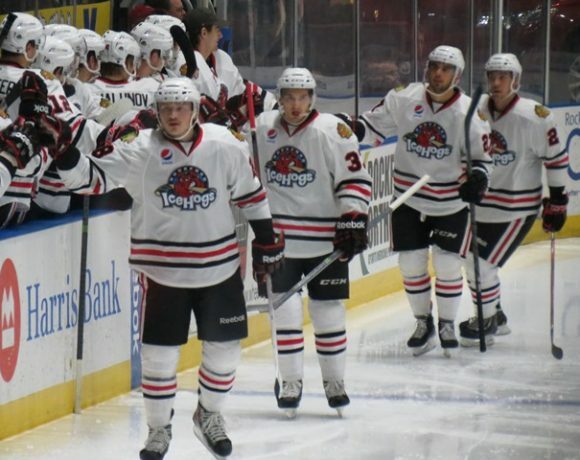 Can Rockford build on this three-game win streak? Hopefully. The IceHogs have not provided any indication of being a playoff-caliber team in the first three months of the season. It would be nice, however, to see them tighten up and move up a bit in the standings. As of this writing, Labrie has not been suspended for any of his shenanigans. Call it an early Christmas present from the AHL. The league did watch the fracas; Binnington was given a one-game vacation for his role in the evening’s festivities. Well, I guess that wraps up my thoughts on this quiet little midweek tilt. As you can see, things get busy for the Hogs right about now. Let’s hope they keep up their recent winning ways.